Ursula Burke is an artist based in Northern Ireland. Her practice consistently questions the tenuous links between idealised forms of civil society and the reality of living in post-conflict communities. Vestiges, the title of her exhibition at Ormston House, refers to the visible evidence of something that is disappearing or no longer exists. Combining art historical techniques and contemporary themes, Burke presents a suite of portrait-sculptures and an embroidered frieze which question the legacy of art as a tool for political propaganda. Each imperial dynasty, particularly in Roman history, sought to emphasise certain aspects of representation in an effort to legitimise their authority. 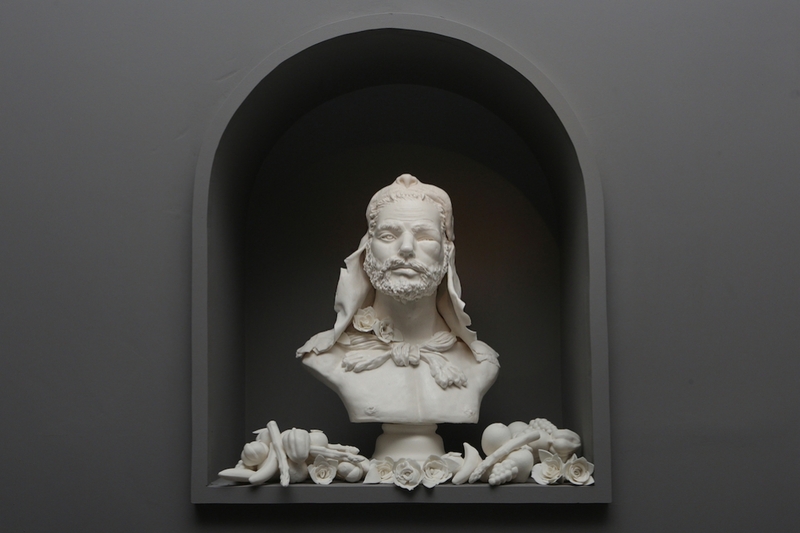 Using Parian porcelain, famed for emulating the carved marble sculptures from Antiquity, Burke adopts visual tropes and surviving fragments of the Classical tradition. Rather than enshrine the heroic or powerful, Burke captures the darker side of revolution and conflict, formalising violence caught at a moment in time. Her portrait-sculptures are imbued with a potent discomfort: the nameless faces of men and women, bruised and injured, never to be healed. The Politicians 2016, a new frieze inspired by Baroque embroideries, depicts incidents of fighting politicians from all over the contemporary world. In the midst of rising global tensions, ideal versions of society unravel, and the reality of dissension is suspended in the threads. This body of work was developed during the centenary of the Easter Rebellion marking Ireland’s struggle for liberation from colonial rule, and in the context of continuing negotiations in post-conflict Northern Ireland. Through Vestiges, Burke speaks to an indeterminate point in the future when real, meaningful and lasting peace has been realised. Special thanks to Oonagh Young Gallery, Dublin. Image: Ursula Burke, The Fallen Tiger (2016), Parian porcelain. Photograph by Deirdre Power.